On February 12, 1736 the Dock Street Theatre opened with a performance of The Recruiting Officer. Built on the corner of Church Street and Dock Street (now known as Queen Street), the Historic Dock Street Theatre was the first building in America built exclusively to be used for theatrical performances. Flora, the first opera performance in America, took place at the Historic Dock Street Theatre. The original Dock Street Theatre was probably destroyed by the Great Fire of 1740 which destroyed many of the buildings in Charleston's French Quarter. In 1809, the Planter's Hotel was built on this site and in 1835 the wrought iron balcony and sandstone columns of the Church Street facade were added. A number of notable persons worked and patronized the Planter's Hotel including the noted 19th Century actor Junius Brutus Booth (father of Edwin and John Wilkes Booth). Robert Smalls, an African-American Civil War hero, who stole a steamboat in the harbor and sailed it out past the Confederate held Ft. Sumter and turned it over to the blockading Union Fleet, served as a waiter in the hotel's dining room prior to the war. Charleston's famed Planter's Punch was first introduced here. After the Civil War, the Planter's Hotel fell into disrepair and was slated for demolition. But in 1935, after Milton Pearlstine made the property available to the City of Charleston and at the urging of Mayor Burnet Maybank and other notable citizens, the original building became a Depression Era WPA (Works Progress Administration) project. At that time, the present theatre was constructed within the shell of the Planter's Hotel. The hotel's grand foyer became the grand foyer of the theatre and the hotel's dining room now serves as the box office lobby. The beautiful woodwork and mantels of the second floor drawing room were salvaged from the Radcliffe-King Mansion (circa 1799) which stood at the corner of George and Meeting Streets and was razed to build the College of Charleston gymnasium, another WPA project. 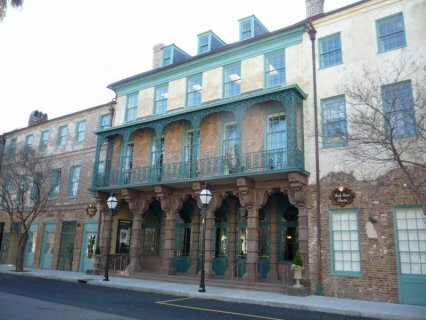 Modeled on eighteenth century London playhouses by Charleston architect Albert Simons, the present Dock Street Theatre's new stage house and auditorium were built in the hotel's courtyard. The local carpenters who were put to work as a part of this Depression era relief effort utilized locally grown and milled native black cypress for the beautiful warm wooden interior. Following this $350, 000 renovation, The Historic Dock Street Theatre's second grand opening took place on November 26, 1937. Notables in the audience included author DuBose Heyward (Porgy) who was named writer-in-residence.